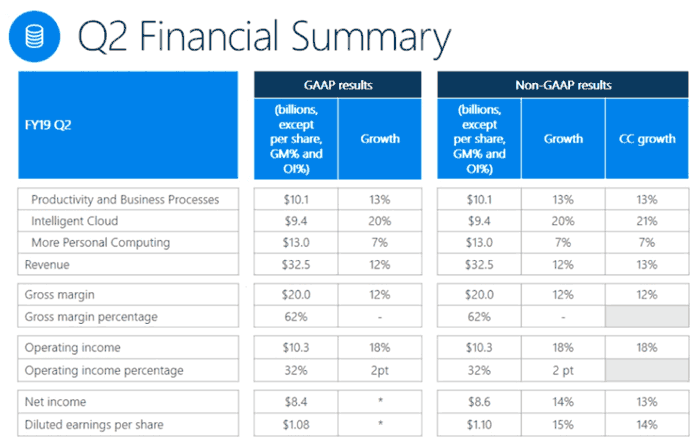 Microsoft has just published its FY19 Q2 results. Though on the surface, ahem, the results look good, investors were left a little underwhelmed by the figures and thus Microsoft shares are trading about 3 per cent down afterhours. Satya Nadella, CEO of Microsoft, put out a positive statement which addressed almost entirely the 'cloud' business Microsoft has been pushing since he took hold of the reins. "Our strong commercial cloud results reflect our deep and growing partnerships with leading companies in every industry including retail, financial services, and healthcare," said Nadella. The Microsoft CEO's statement was backed by what sound like very good results – Azure revenue, for example, was up 76 per cent, and overall revenue in Intelligent Cloud was $9.4 billion, and increased 20 per cent. 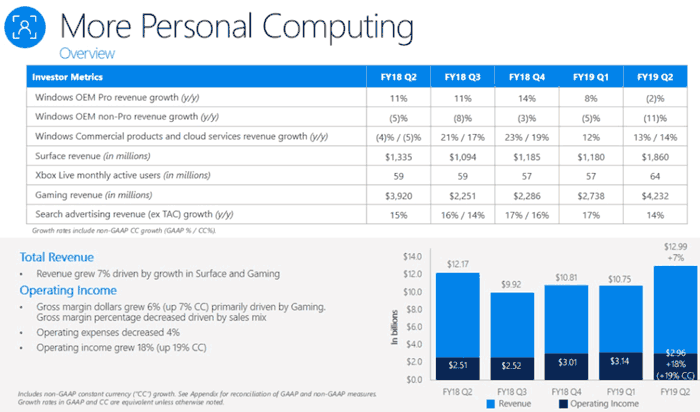 This would be dandy, except that last year Azure revenue grew 98 per cent. So we have witnessed a deceleration here. Moving along to another of Microsoft's three business segments, revenue in Productivity and Business Processes was $10.1 billion and increased 13 per cent. Star performers in this segment were Office 365 commercial revenue growth (34 per cent), LinkedIn revenue growth of 30 per cent and Dynamics 365 revenue growth of 51 per cent. 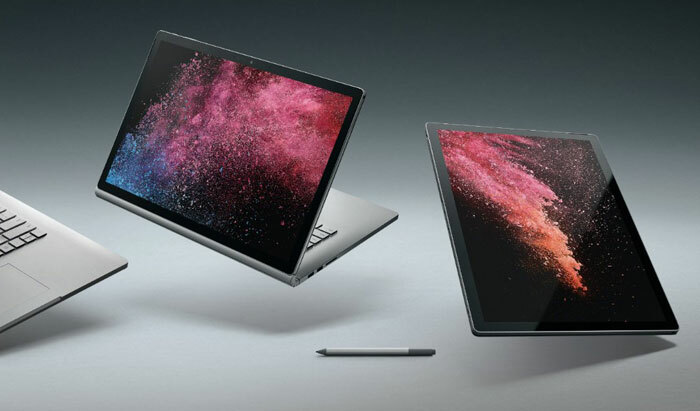 In a post-results earning call, Satya Nadella highlighted that "Surface had its biggest quarter ever this holiday, delivering strong double digit growth in both consumer and commercial." He asserted that the Surface line would continue to innovate and grow. In terms of games, Microsoft is trying to "transform how games are distributed, played and viewed," with an eye on community and cloud services helping towards this goal. On Xbox, it was noted that Xbox Live monthly active users reached a record 64 million – including mobile and PC users. This would be dandy, except that last year Azure revenue grew 98 per cent. So we have witnessed a deceleration here. erm … not to be overly picky, but a 76% increase this year on top of a 98% increase last year means the monetary growth would actually be ~ 1.5x larger this year, as the baseline for this year's growth is twice as much. I wouldn't call that a deceleration, personally. Typical Analyst: Growth not a perfect hockey stick? Vote down.